If you have been subjected to police brutality, you can sue the police for their unlawful behaviour. O’Brien Criminal and Civil Solicitors are recognised as leaders in the area of law of false arrest, unlawful imprisonment and malicious prosecution. Transit officers for assault, battery and false imprisonment. Our civil solicitor, Deo Indevar, has successfully settled many claims against the Police which have resulted in substantial compensation for our clients. Scroll to the bottom of the page to read our case studies and testimonials from our many satisfied clients who have received compensation payouts. When can you have an action against the police? 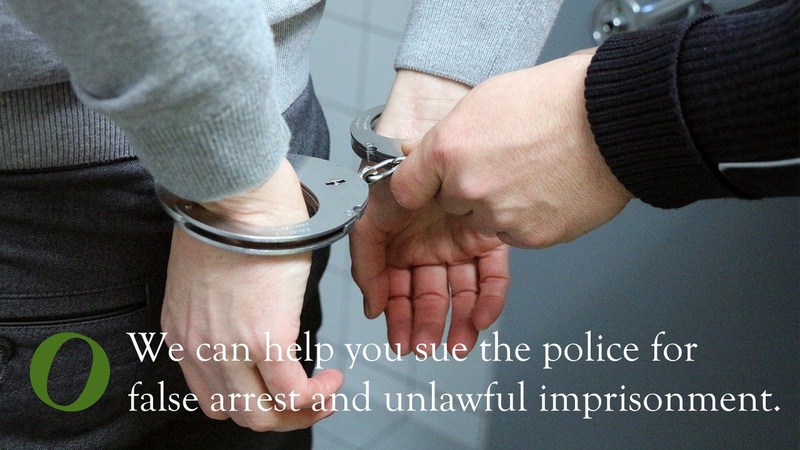 A situation where you have been arrested and charged with a criminal offence, the charges have been dropped and the Magistrate has made a finding that your arrest was unlawful. This may include circumstances where the police did not have the power to arrest and/or excessive force was used by the police to make an arrest. A situation where you have been arrested and detained in relation to bail conditions or AVO conditions which have previously been varied, dispensed with or where such conditions no longer exist. O’Brien criminal and Civil Solicitors have a significant practice in the conduct of civil actions against police (suing the police) for matters of unlawful arrest and unlawful imprisonment. The firm has achieved outstanding success in this field of law. To examine many of our other successful cases in this area, click here. We can represent you in your civil claim against the police on a no win, no fee basis if we think that your case has a high probability of success. Speak to us about your matter where we can advise you on the likely prospects of your case and whether we can run your case on a no win, no fee basis. We also are experienced in and able to conduct cases involving suing the police in locations other than NSW for false arrest and unlawful imprisonment . We have experience in Melbourne, Victoria; Adelaide, South Australia; Brisbane, Queensland; Darwin, Northern Territory; Western Australia and Tasmania. If you are located outside of NSW, you can simply give us a call and tell us a bit about your matter. You will be booked in for a free initial consultation with one of our civil solicitors who can assist you with your matter. Our Principal, Peter O’Brien, and civil solicitor, Deo Indevar, are seen as leaders in the fields. Peter has been called upon to lecture other lawyers on the finer points of this area of the law. To see Peter’s conference paper on the topic of actions against the police – click here. He is also the co-author of a leading book in this area, covering all jurisdictions. Deo specialises in this area of law, and has achieved successful settlements with a large number of clients. View some of his successful cases here. Thanks Deo for helping me achieve a good outcome in my case! I approached O’Brien Criminal and Civil Solicitors in regards to my civil matter. I had been unlawfully arrested and was originally not going to proceed with my claim because I didn’t think that I had a winning case. However Deo convinced me that I had a case and has been very helpful throughout the entire process. Deo explained the law and my case thoroughly. He was in constant contact throughout the entire process and kept me up to date with what was going on. I am extremely pleased with the outcome and it was exactly what I wanted. I recommend to anyone with any problems that O’Brien Criminal and Civil Solicitors is the way to go! As a victim of police brutality, I was dismayed by the total lack of concern and a refusal to investigate the complaint I made in writing to the NSW Police and NSW Ombudsman. When the baseless charges against me were finally dismissed on appeal in the District Court and the Police again refused to investigate my complaint against them, I felt compelled to take civil action against the NSW Police, in an effort to seek accountability on the part of NSW Police. Even before I contacted O’Brien Solicitors, I was encouraged by the information and positive attitude shown on their website. Peter O’Brien and the team at O’Brien Solicitors have been wonderfully helpful and supportive in seeking legal redress through the Courts. I was amazed and relieved when O’Briens solicitors achieved an outcome that spared me any further distress or inconvenience and more than satisfactorily compensated for the pain and suffering I had endured as a result of my unfortunate encounter with a couple of over-zealous police officers. I wholeheartedly recommend O’Brien Solicitors to anyone who has experienced police misconduct and had their rights trammelled by heavy-handed police officers. If you are thinking of making a civil claim against the police, speak to our false arrest lawyers today for expert legal advice. Call us on (02) 9261 4281 for a free initial consultation to discuss your legal options.